MCM Training – Week 13 Long run (16 Out of 17 Ain’t Bad) | So What? I run. This weekend’s mileage for our long run was between 16 – 17 miles, so I had my heart set on 17. Even posted on Facebook that I was running 17, cause you know you MUST do it if you post it. But at 16, I was done and I was fine with it. Well, I wasn’t actually totally fine with it, but fine enough to stop and not whine too much about it. My Garmin had died, my legs were tired, and I wanted brunch. I’m pretty sure I could’ve pushed through to the 17, but after running 4 yesterday, I decided I didn’t need to…brunch was on the brain instead. Looking at our pace, I can now see why my legs were so tired. Definitely ran faster than previous long runs, so I’ll take it! 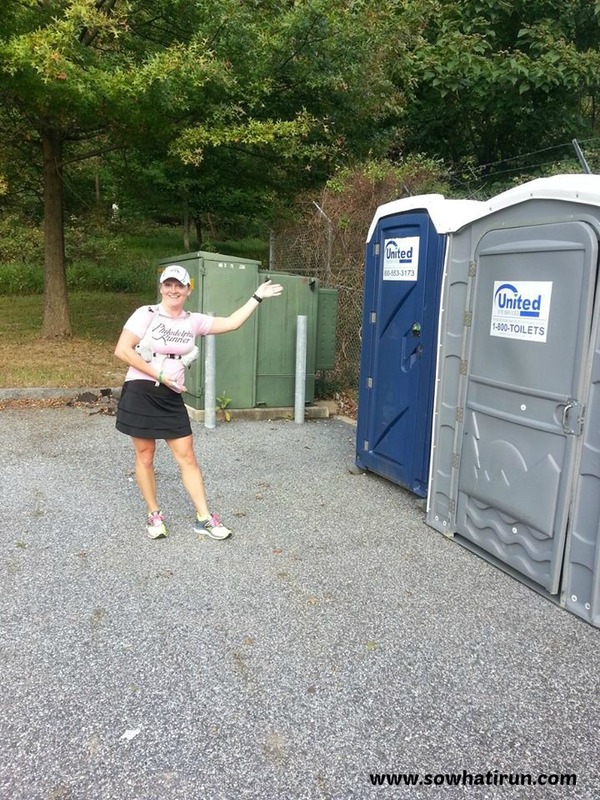 The best part about today’s run was the surprise port-a-potty on the route. SCORE! No doing your business in the wood (and you know we almost always half to) and no need to adjust your pace so that you get to your go to spot to do a #1 or a #2. You can do both right there! They might as well have had halos hovering over them when we saw them. Alas, they are only there for this weekend, but we made sure we used them several times so whoever put them there got their monies worth. I had to take a pic of my running partner with the glorious pots…we’ll never see it again <sigh>. This entry was posted in Marathon Training and tagged long run, Marathon Running, Marathon Training, marine corps marathon, mcm marathon, MCM Training, Running, Sports by SoWhatIRun. Bookmark the permalink. Haha – I love that the porta potties showed up – always awesome, right?